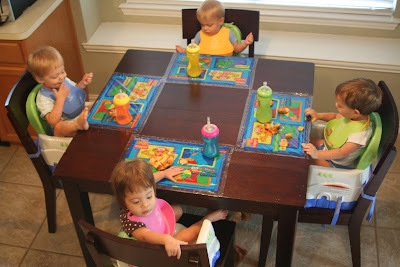 We took the babies out to eat a few times while Papa and Grandma were visiting from Iowa and they did so well that I thought maybe it was time to raise up those booster seats and let them eat at the table like the big kids that they are. It didn't go so well the first time. My first mistake was that I decided to give them plates for the first time and topped them with little pieces of green beans and corn. Sophia was the first to flip her plate up and corn pieces went flying...as did my temper. Well, the reaction she got from me must've made the boys curious what I would do if they did it too. 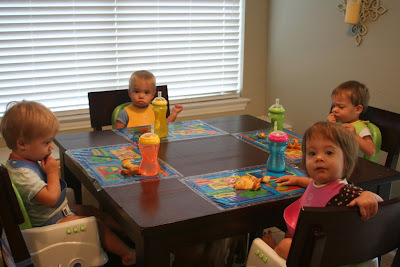 So they flipped their plates and food everywhere and mommy flipped her lid again. I calmed myself down and vowed to do it better next time. I remembered that a friend of mine had given me these table topper place mats that are like a big sticker on the table, so I put those on and put their food on top of that. It worked out better since only Noah figured out how to get it off and get food everywhere. Today we brought plates back, because honestly the stickers aren't such a practical application when you use four at a time (I'll save those for the restaurants) and they are doing better. 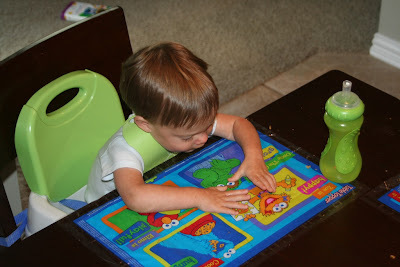 Table manners 101 will be next week...maybe next month. For now, we'll focus on how we don't need to worry about what the bottom of a plate looks like. Woo-hoo! We're big kids now! The bottom of a plate can be very interesting, as can discovering how feet look on a table. Still my favorite little playmates! Much love. 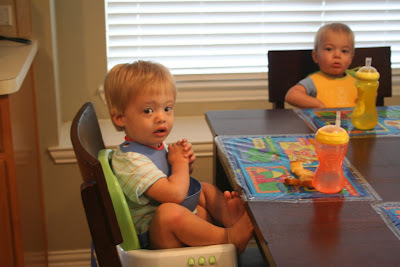 We used the same booster seat! Loved it! I love it...good job Mama!!! Suction cup bowls might help. I found plates at one point as well. Good luck! They are getting so big! Awwww so cute. 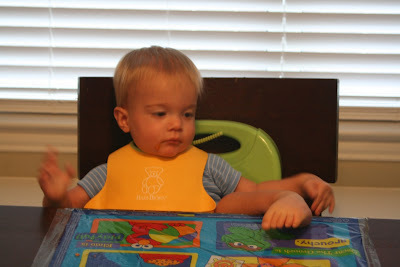 Finley throws any sort of plate or loose cup so we use the suction cup bowls still. I'll have to check those suction bowls out! It's day 3 of plates and food it still flying everywhere when the plates get dumped over.